Recently I revisited Oscar Lewis’ thesis of “Culture of Poverty.” Simply stated it tells you that context determines every thing. If you wear rose coloured glasses, everything appears red and if you wear blue coloured glasses every thing appears blue. There has always been a struggle between those who came to a city and live in slums and those who live in flats. 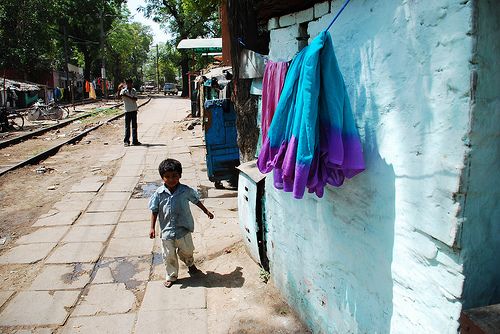 Alternate perception of the slums is a material deprivation. Economist define slums as places where the expense per capita is low. Right now I am staying in a small room of an empty flat. It has nothing. No tables, no chairs, no cupboards, no shelves, no nothing. There is one folding bed to sleep on, one air conditioner to bear the heat. And few very functional electrical appliances like a fridge, washing machine, TV and a gas connection. If one were to buy all these second hand, it would together barely cost you more than a few thousand rupees. My daily expenses are never more than a hundred and fifty rupees. I am eating three meals. I watch television. All this compares well with a person living in a slum. It allows me to be very functional and creative. I have covered a lot of ground academically by writing and socially by meeting up people I have been planning to since the last few years. I painted canvases and I embroidered. What a great holiday it is proving to be over the last two weeks. If a slum is a place where there is material deprivation and I am living in a place that has material deprivation why is it that I cannot experience it as a slum? Why do I feel it is a holiday? Because for me the context is very different, for me I am here for two weeks and then I go back to my fully furnished apartment. Thus, unless the person living in the housing areas sees it be areas that were once relatively affluent but which deteriorated as the original dwellers moved on to newer and better parts of the city, it is not a slum. Hence many shack dwellers vigorously oppose the description of their communities as ‘slums’ arguing that this results in them being pathologised and then, often, subject to threats of evictions. Many academics have vigorously criticized UN-Habitat and the World Bank arguing that their ‘Cities Without Slums’ Campaign has led directly to a massive increase in forced evictions, like Yamuna Pushta.